Did the father of our country, George Washington, really have wooden teeth? The Dakota Dental Apple Valley Dentistry myth bustin’ team reports that although it is true that George had lost most of his teeth before he became president due to the poor dental services and dental procedures of that day, it is a “Mouth Myth” that President Washington’s teeth were made of wood. 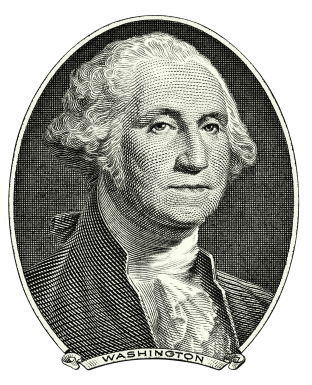 According to a study of Washington’s four known dentures by a forensic anthropologist from the University of Pittsburgh in collaboration with the National Museum of Dentistry and the Smithsonian Museum, George Washington’s dentures were made of gold, hippopotamus ivory, lead and human and animal teeth – including horse and donkey teeth. George’s dentures were of course made by the most prominent dentist of that time, Dr. John Greenwood and hand carved from the finest hippopotamus ivory and gold available. One of the sets of dentures was actually stolen from the Smithsonian in 1976 from a bicentennial exhibit presumably for its gold content and has never been recovered. The upper and lower gold plates of George’s dentures were connected by springs which pushed the plates against the upper and lower ridges of his mouth to keep the dentures fitting snuggly. This means that President Washington had to be very intentional about holding his jaws closed to make his teeth bite together. If Mr. President relaxed his jaw, his mouth would pop open! 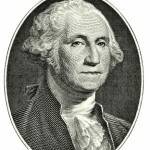 Additionally, because the loss of Washington’s original teeth left him with badly sunken cheeks, George stuffed his cheeks with cotton to achieve a healthier look. Without a doubt, we have much to be thankful for today! The preventative dentistry services, emergency dental services and professional dental procedures provided by Dakota Dental Apple Valley dentistry will help you keep your teeth for a life time – maintaining the comfort of your dental and oral health as well as an attractive appearance. If you’re ever in Baltimore, you can stop by the Dr. Samuel Harris National Museum of Dentistry to see President Washington’s remaining sets of dentures first hand as well as other fun, interesting dental artifacts. And about George cutting down that cherry tree … historians say it’s almost certainly untrue but does accurately reflect the traits of our first president whose great place in history and political success was attributed to his great strength of character – certainly not his dazzling, politician smile!